Obedience and socialization is important to us for our dogs, all of ours go to Jacqui's and learn the important things and also how to play with good "doggie manners" with others. We strongly recomend at least the puppy classes for ALL breeds of dogs! My name is Vanessa, I moved to Australia in 2000. I have had dogs as a integral part of my life for over 30 years now. I have always had a whippet or two by the fire. Though only starting my showing in 2007, I have raced/coursed whippets for many years. I love the true instincts, elegance and grace of this fantastic breed. Only recently have my whippets been of a show stock, as my whippies before were of racing and hunting lines. 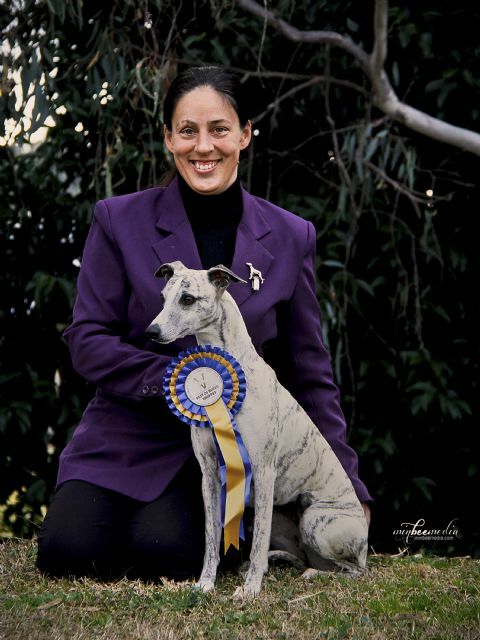 My first show puppy was purchased was from Wendye Slatyer of Calahorra Kennels. Makayla is of exceptional breeding and a true joy to own. Makayla also did obedience and Agility when she was younger. I then brought in one of my racing girls, Georgia into the show ring. She is from a dear friend Ian Dunk of Eljireh Kennels. She is a stunning black girl of true character and size. My beloved Georgia is now well and truly retired at 13 years old. Her favorite place now is snuggling with me on the couch! Thanks to Shauna Summers of TripleStar Kennels (USA) in 2014 we imported the handsome Ruger "Am Ch.TripleStar Son Of A Gun JC" to live with us here in Australia! Some very exciting times ahead for us! Now since December 2009 we have added the gorgeous greyhounds to our show team as well! Thank you to Xilone Kennels & Brantarby Kennels as well as Helen, Mel and Nikki Jones of Whirlaway Kennels! Please look inside to see what comes next for us at Kanati!